Energy efficient enclosures built in hot-and-humid climate zones often result in reduced dehumidification provided to interior spaces by air conditioning systems. Unfortunately, this can lead to serious hygienic consequences. In temperate climate zones on the other hand, increased airtightness, diffusion resistant insulation systems, and built-in moisture are causing moisture problems and mold growth. Based on problems with excessively high or low humidity levels in buildings, the ASHRAE board of directors decided over ten years ago to establish a technical committee with the title of “Moisture Management in Buildings.” Earlier in 2017, this same committee, under the lead of Prof. Hugo Hens Emeritus KUL, Belgium and with participation of the Fraunhofer researchers Florian Antretter and Prof. Dr. Hartwig Künzel, authored a new chapter of the ASHRAE Handbook of Fundamentals devoted to moisture management in buildings. 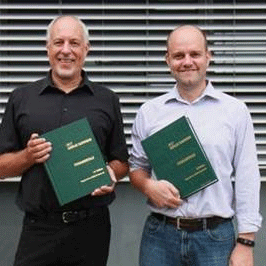 Given that the Handbook is the most popular book worldwide for the planning and sizing of HVAC equipment with reference to the building envelope, this collaboration with Fraunhofer IBP is a logical step towards furthering the practice of moisture management in buildings. The many different causes for moisture-related problems in buildings are discussed in the new chapter, as well as the quantification of moisture sources and sinks. Prof. Dr. Künzel explains: “The new chapter highlights the crucial role of moisture storage in the interior surfaces of the building envelope and building interior – also called moisture buffering – for a healthy and comfortable indoor environment.” The newly-included information will help architects and mechanical engineers, throughout the design process, to develop appropriate decisions based on hygrothermal building simulation. Fraunhofer IBP provides suitable tools with the simulation software WUFI® Plus and WUFI® Passive and supports users with accompanying trainings.